You constantly need more countertop space, to write down a grocery list, set aside dishes, or start setting out the ingredients to make dinner. Having enough countertop space in your kitchen is so important because without it your kitchen becomes less practical. 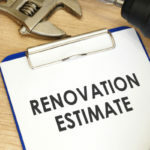 No matter if you rent or own your home, are looking to make big changes or small changes, the tips provided in this blog will come in handy to help you add more countertop space to your kitchen. Hanging items that otherwise clutter your available countertop space can add a whole new layer of space to your cooking domain. Attractive, sturdy shelving can be purchased for affordable prices and bolted to the side of your kitchen wall. Keeping things out on the counters is a way to decorate, but by adding shelving throughout your kitchen you are able to take back more countertop space while still decorating the kitchen with your favorite knick-knacks and utensils. For example, most people keep cooking utensils in a round jar of some sort beside the stove, hogging up precious countertop space. You can easily place your jar of spatulas and tongs on a shelf hung conveniently near the stove in order to save a great deal of space. 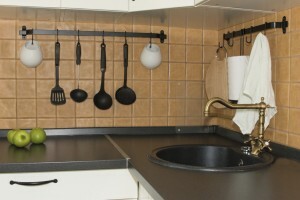 Instead of shelving you can opt for a hanging rack to attach your spatula and cheese grater. There are a number of ways you can install a pull out cutting board to your kitchen, adding a great deal of extra countertop space. Without a pull out board, you end up having to make room for your portable cutting board. Slide out cutting boards are generally built in just between the top drawer and the countertop, offering a comfortable height to work at. If you don’t have the budget to install a pull out cutting board, you can get a portable cutting board that is made to fit over the sink. This option still saves space and offers some added convenience. 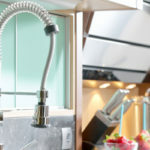 Many over the sink cutting boards come with removable trays, which can be used to collect food, or removed and used as a chute to throw unwanted scraps directly down the sink disposal. Make more room under the stove to store things currently hogging up countertop space, and relocate your pots and pans to a pot rack. A pot rack can be purchased in any style, from rustic to modern, and is generally hung over the center island of your kitchen. A pot rack grants you easy access to your dishes when you need them, but also offers an out of the way place to store them. Our customers often assume that if there is window on a certain wall they can’t add any shelving there. But you can add shelving over a window, and when done right it adds more space to your kitchen and looks amazing. The key is to install shelving that is simple and not overpowering. Shelving that overlaps a window is ideal because it grants the perfect backdrop to anything you store here. Just make sure you don’t clutter these shelves too much, as you still want the natural scenery outside to flood in. With so much sunshine, these shelves are the perfect place to add your sun-loving plants, and decorative containers for odds and ends that would otherwise be clogging your counters. Generally, kitchen islands are made with cabinets built into the front side, and flat or detailed paneling on all other sides. This leaves a lot of workable space wasted. Make use of this space by installing a bookshelf, or extra cabinets to the side of your island for unique styling and added space. Freestanding shelving made specifically to fit into a corner can save a world of space. These shelves are portable, meaning you can add them inside of cabinets to gain more room, or on top of your counters near the sharp corner edges. This clever trick is cheap, looks nice, and helps you save space and get more organized. If you like to keep pasta, pretzels, and corn in mason jars you may be wasting a lot of space storing these pretty glass containers. A super creative way to save space and still keep your handy-dandy jars is to affix the lids to the underside of your cabinets. Simply unscrew the jars, as you need them, without wasting one-inch of counter or cabinet space. If you have 4 burners on your stove but you generally only use 1 or 2 for cooking, you can make use of your other burners. Specialized cutting boards come with legs and can be placed directly over stove burners. By making use of unused stove space you get more countertop space in return. A simple hook installed to your kitchen wall can serve as the perfect place to hang your dishtowels, potholders, and apron. Potholders hog up space when they are stored in a drawer or left sitting out on counters. By simply hanging them from a hook you keep them accessible, but also out of the way. 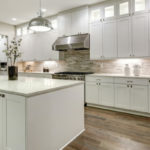 Just don’t forget to purchase ones that look good and match with your overall kitchen décor, because once you hang something it becomes a part of the overall design. If your kitchen has any gaps between countertop spaces, you can fill these unused and wasted spaces using freestanding butcher blocks and counters for sale at IKEA and other retailers. Measure the gap space and then look for a comparable freestanding countertop. 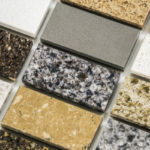 You might be surprised at the awesome options available out there, capable of transforming wasted space into additional countertop. One of the easiest ways to instantly add more countertop space is to invest in a rolling cart for your kitchen. These add more storage space, as well as counter space. These carts come in a variety of colors, materials, and price points. There is one for every kitchen size, style and budget out there. Plus, since many come on wheels they are easy to move around as needed. What appliances do you currently have out on your counters… a coffee maker, blender, mixer, toaster? If you have numerous small appliances set out on your counters you can quickly lose a lot of space and feel completely cramped. If you don’t use an appliance every other day, it doesn’t need to permanently hog up your countertop space. After deciding which of your small appliances can be removed, you’ll have to find a place to store them. Finding room for the mixer in the cabinets is as easy as finding a new place to house all of your coffee mugs. While coffee mugs can be hung from the wall or beneath a cabinet, your mixer can enjoy the taller space in the cabinet your mugs once occupied. Knife blocks have been a popular kitchen staple for years, and while they offer a nice way to showcase and access your best knives they take up a lot of space. Install a good-looking magnetic knife strip to the backsplash in your kitchen and you can hang your knives here. Not only does this look really cool, but also it frees up countertop space. Countertops often become overcrowded because there isn’t enough cabinet space. You can solve your cabinetry problem without burdening your available countertop space by adding shelving to an unused wall. Store your nice dishes on these shelves and you free up a lot of cabinet space to store things currently crowding up your counters. If you can afford to add more cabinets, this is always an option as well. Yet, for tighter budgets starting out with new shelving can make a huge difference. Just be careful that the shelving is not overcrowded or mismatched, as this can make the kitchen look sloppy and cluttered. Regularly go through your kitchen and give away the things you no longer need or use. Someone else might love it, but you don’t need if it’s only hogging up space. Make use of ALL cabinet space to free up countertop space. You can do so by investing in cabinet shelving that works for you. For example, pull out drawers makes it easy to utilize and access every last inch of your cabinets. Other options include adding a Lazy Susan, or freestanding corner cabinet shelving to make the most of dark, deep cabinets. Tops Kitchen Cabinet provides the latest cabinets, countertops, accessories and more at wholesale prices. Check out our vast selection of inventory today for the kitchen remodel of your dreams at a price you can afford.